A Typical WTF Press Conference? 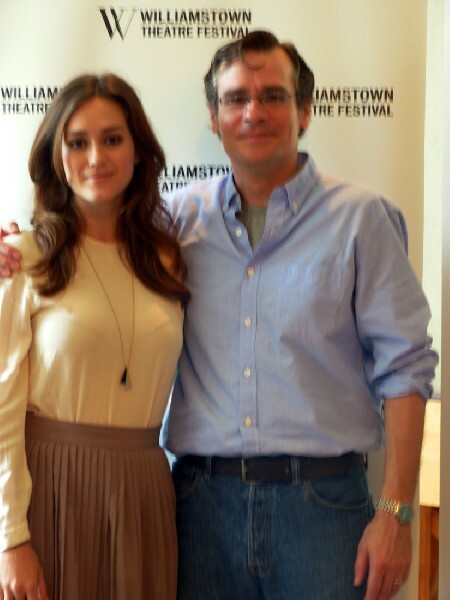 Lead actors: Heather Lind, Eliza Doolittle and Robert Sean Leonard, Henry Higgins, in Shaw’s Pygmalion. All photos: Astrid Hiemer. Johnny Baseball team: Gordon Greenberg, De’Adre Aziza, Brooks Ashmankas, Richard Dresser. 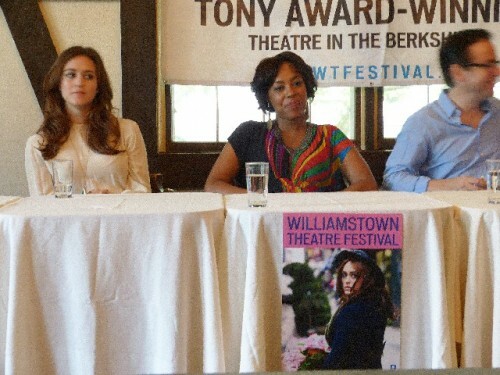 Panel: Jenny Gersten, Artistic Director of WTF, Leonard, Lind, Aziza. Other panel members: Aziza, Greenberg, Ashmanskas, Dresser. Lind, Aziza with Pygmalion poster. Greenberg’s turn in the discussion. 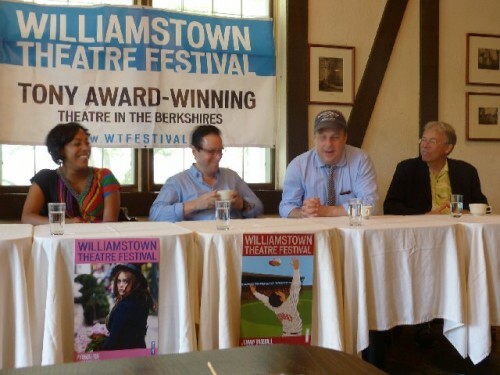 Before the Press Conference at the Williams Inn on July 9th, the buzz was about Hapgood by Tom Steppard, which would open in a couple of days at the Williamstown Theatre Festival with a star studded cast; already nearly sold out. It was the role of ‘Mother’ in this surreal sci-spy play that drew Kate Burton back to the Berkshires this summer. Emphasis that morning would be on the next two productions: Pygmalion, July 17 – July 27, and Johnny Baseball, July 24 – August 3. 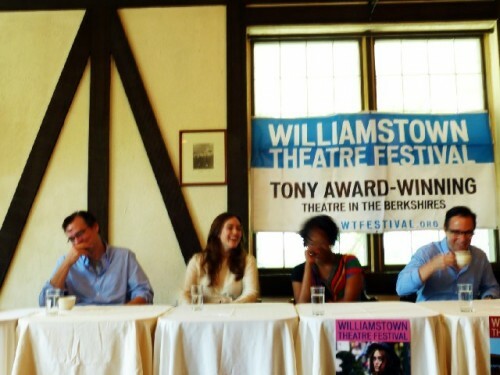 A group of area theatre critics were invited to attend. After the breakfast buffet, down to business! 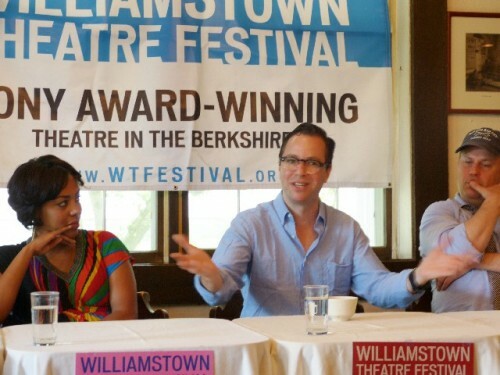 Jenny Gersten, Artistic Director of WTF, first apologized to the working actors for an early wake-up call, then introduced her team: Robert Sean Leonard as Henry Higgins, Heather Lind as Eliza Doolittle. 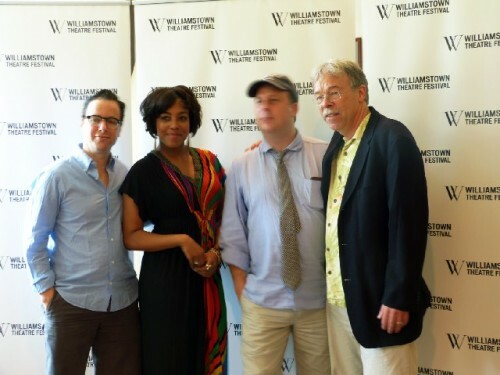 Gordon Greenberg is the Director of Johnny Baseball and cast members: De’Adre Aziza as Daisy Wyatt, a Blues Singer, and Brooks Ashmanskas will play four roles in Johnny Baseball. Richard Dresser was present, who wrote the book on the history of the Boston Red Sox. He collaborated with Robert Reale, music and Willie Reale, lyrics for the musical; both did not attend. The group, seated at the head table took turns speaking about their roles, about recent or many years of involvements with WTF as well as thoughtful and revealing responses to a couple of targeted questions from the floor. Individual five minute interviews would follow and finally, the official photo sessions. Leonard had walked around the room, greeted everyone, shared some personal information about family and housing in Williamstown and made us all comfortable. A friendly guy, really the friendly Dr. Wilson of House, the role he played in 170 episodes. His resume also contains on- and-off-Broadway productions as well as national and international film and theatre commitments. He will be playing Henry Higgins in Pygmalion, by George Bernard Shaw, and sees his character acting more like a Robert Downy Jr. of 1980s, rather than Rex Harris in the movie version, who was tall, aloof and methodical to the task of turning Eliza Doolittle, a street urchin, into a Lady! Nicholas Martin is directing the play. Lind, young, talented, beautiful and charming is a proud returning member to WTF and spoke about her prior experiences. She had first been here as a budding actress and, as Gersten pointed out, the kind of success story WTF loves, namely, presenting a home grown artist in a major role. 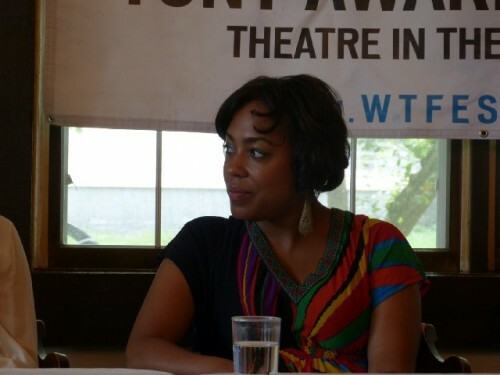 She has already worked on-and- off-Broadway, in films and TV. 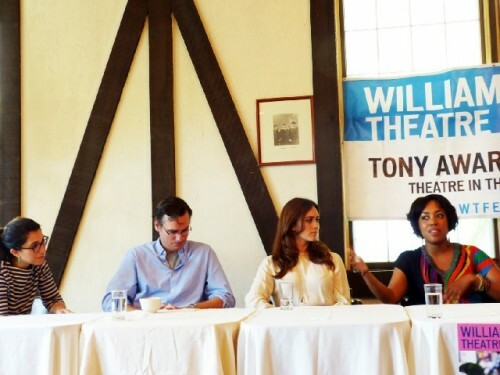 In fact all actors bring with them New York City and many other theatre experiences to the stage. “She’s got it all” was a comment I overheard a critic say later. I saw a highly charged performance of My Fair Lady, based on Shaw's Pygmalion last December at the Arena Stage in Washington, D.C. and am looking forward to this production. Greenberg, the director of Johnny Baseball, has been writing, directing and developing a long series of projects. He was a more quite member at the table. Since the production at the American Repertory Theatre in Cambridge, Massachusetts, scenes and songs have been added to strengthen the play. Aziza will portray the role of African American blues singer Daisy Wyatt. She was the love of Johnny O’Brien, the title character. The musical is set during times of the 85 year long ‘drought’ and alleged ‘Curse of the Bambino or the Red Sox Curse’ for trading Babe Ruth to the New York Yankees. Socio-political themes and racism in the club’s ranks and in the region are woven into the musical. Ashmanskas, is well known at WTF. He claimed to have been a Red Sox fan all his life, even though he grew up in Middle America. Really? His father was a Sox fan and so the son was lured in as well. We’ll be looking forward to the four characters he’ll portray. Actually, he’s quite a joker and apparently used to taking center stage most of the time. Leonard would lean forward, looking over to Ashmanskas and asked repeatedly for permission to continue speaking. What a pair! Louise Kennedy, the Boston Globe critic until 2010, was promptly dismissed after Dresser had sent a letter to The Globe. In her review of Johnny Baseball she asserted that the play contained homophobic material. Colleagues in the newsroom tried to persuade her that she was wrong and not to publish. Apparently, she had seen the play with her young son, was offended, and under deadline. She made a serious mistake. Dresser said that he had never written in response to a theatre critique, this time he did and he does not regret it. With charged energy in the air, the ‘5 Minute Dates’ followed as individual interviews were dubbed. Each member of the press was assigned in advance to four interviewees. The Berkshire Eagle phoned in for interviews. Their loss – it was a fun, informative and revealing event!